We have used biomass energy, or "bioenergy"—the energy from plants and plant-derived materials ,since people began burning wood to cook food and keep warm. Wood is still the largest biomass energy resource today, but other sources of biomass can also be used. These include food crops, grassy and woody plants, residues from agriculture or forestry, oil-rich algae, and the organic component of municipal and industrial wastes. Even the fumes from landfills (which are methane, a natural gas) can be used as a biomass energy source. •The use of biomass energy has the potential to greatly reduce greenhouse gas emissions. Burning biomass releases about the same amount of carbon dioxide as burning fossil fuels. However, fossil fuels release carbon dioxide captured by photosynthesis millions of years ago—an essentially "new" greenhouse gas. Biomass, on the other hand, releases carbon dioxide that is largely balanced by the carbon dioxide captured in its own growth (depending how much energy was used to grow, harvest, and process the fuel). •The use of biomass can reduce dependence on oil because biofuels are the only renewable liquid transportation fuels available. 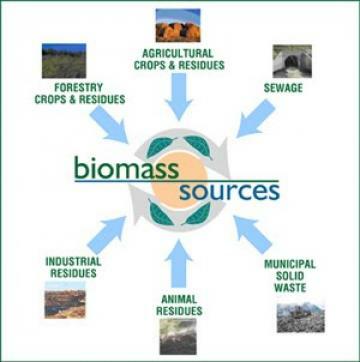 • The main biomass feedstocks for power are paper mill residue, lumber mill scrap, and municipal waste. For biomass fuels, the most common feedstocks used today are corn grain (for ethanol) and soybeans (for biodiesel). In the near future—and with NREL-developed technology—agricultural residues such as corn stover (the stalks, leaves, and husks of the plant) and wheat straw will also be used. Long-term plans include growing and using dedicated energy crops, such as fast-growing trees and grasses, and algae. These feedstocks can grow sustainably on land that will not support intensive food crops. Hydropower is one of the oldest sources of energy. It was used thousands of years ago to turn a paddle wheel for purposes such as grinding grain.Because the source of hydroelectric power is water, hydroelectric power plants must be located on a water source. Therefore, it wasn't until the technology to transmit electricity over long distances was developed that hydropower became widely used. Many technologies have been developed to take advantage of geothermal energy—the heat from the earth. This heat can be drawn from several sources: hot water or steam reservoirs deep in the earth that are accessed by drilling; geothermal reservoirs located near the earth's surface, mostly located in western states, Alaska, and Hawaii; and the shallow ground near the Earth's surface that maintains a relatively constant temperature of 50°-60° F.
Other geothermal resources exist miles beneath the earth's surface in the hot rock and magma there. In the future, these resources may also be useful as sources of heat and energy. We have been harnessing the wind's energy for hundreds of years. From old Holland to farms in the United States, windmills have been used for pumping water or grinding grain. Today, the windmill's modern equivalent—a wind turbine—can use the wind's energy to generate electricity. Wind turbines, like windmills, are mounted on a tower to capture the most energy. At 100 feet (30 meters) or more aboveground, they can take advantage of the faster and less turbulent wind. Turbines catch the wind's energy with their propeller-like blades. Usually, two or three blades are mounted on a shaft to form a rotor. Solar is the Latin word for sun—a powerful source of energy that can be used to heat, cool, and light our homes and businesses. That's because more energy from the sun falls on the earth in one hour than is used by everyone in the world in one year. A variety of technologies convert sunlight to usable energy for buildings. The most commonly used solar technologies for homes and businesses are solar water heating, passive solar design for space heating and cooling, and solar photovoltaics for electricity. Businesses and industry also use these technologies to diversify their energy sources, improve efficiency, and save money. Solar photovoltaic and concentrating solar power technologies are also being used by developers and utilities to produce electricity on a massive scale to power cities and small towns.